Serious hematologic conditions such as MDS are associated with an erythroid maturation defect leading to anemia and other clinical sequelae. Luspatercept (ACE-536) is being developed as an erythroid-maturation agent (EMA) for treatment of anemia in lower-risk MDS. Luspatercept binds to select TGF-β superfamily ligands reducing aberrant Smad2/3 signaling and promoting late-stage erythroid maturation and increased hemoglobin (Hgb) levels (Suragani R, Nat Med, 2014; Platzbecker U, Lancet Oncol, 2017). This ongoing, phase 2, multicenter, open-label study followed by a long-term extension (ext) study evaluates the effects of luspatercept in pts with lower-risk MDS. Endpoints include long-term safety and tolerability, erythroid response (IWG HI-E), RBC transfusion independence (RBC-TI, ≥8 weeks), duration of HI-E, pharmacodynamic and iron metabolism biomarkers, and pt-reported quality of life (QoL). New analyses focus on mutational and bone marrow characteristics of luspatercept responders. Inclusion criteria: MDS IPSS low or int-1, age ≥18 yr, Hgb <10 g/dL (if <4U RBC/8 weeks), no prior HMA, and no current lenalidomide or erythropoiesis-stimulating agent (ESA). Pts are treated every 3 weeks subcutaneously for up to 5 doses (titration up to 1.75 mg/kg) in the base study (NCT01749514) and are then eligible for long-term treatment up to 5 additional years (NCT02268383). Baseline bone marrow and blood samples were analyzed by central morphology and flow cytometry according to ELN guidelines for evaluation of erythroid precursors and soluble transferrin receptor. Data (as of 08Sept2017) were available for 88 pts treated at dose levels ≥0.75 mg/kg with evaluable mutational data at baseline. All 88 pts were evaluable for IWG HI-E. Increased response rates were seen in pts with EPO < 500 IU/L. 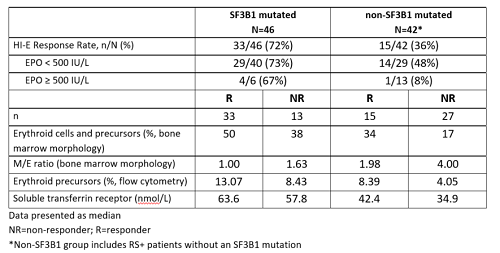 Response rates were also increased in the SF3B1 mutated group vs the non-SF3B1 mutated group. Responders in both the SF3B1 mutated and non-SF3B1 mutated groups had lower M/E ratios at baseline than non-responders with a parallel increase in erythroid precursors. Increased response rates in patients with lower M/E ratios suggest that an expanded erythroid population at baseline may be associated with response to luspatercept, supporting the concept that luspatercept is acting as an erythroid-maturation agent (EMA). Patients with and without the SF3B1 mutation with EPO < 500 IU/L experienced substantial response rates, consistent with earlier results. Additional analyses are ongoing to understand the role of other biomarkers such as mutation status and how they may impact the biology and influence response. As there is not one distinct profile of responder characteristics, this may suggest the possibility that luspatercept may work in a broad range of genotypes and phenotypes.